Bougainvilleas (botanical name Nyctaginaceae) are perennial flowering plants. It is a genus that is composed of up to 18 species. Bougainvilleas are hardy desert plants and evergreen or deciduous woody vines. They originate in South America and flower several times annually. Bougainvilleas have woody vines with many thorns. The vines grow to be 3 to 40 feet in height. The thorns are topped with a waxy, thick, black substance. In regions that have dry seasons, bougainvilleas are deciduous. In rainier climates, they are evergreen. Common colors of bougainvilleas are purple, magenta, red and pink. Bougainvilleas can be cultivated in the U.S. Department of Agriculture's plant hardiness zones 9b through 10. They thrive as hot season plants and are tolerant of drought, making them perfect for warmer climates. They are also highly sensitive to frost. Bougainvilleas have high tolerance to salinity, making them suitable for cultivation in coastal areas. 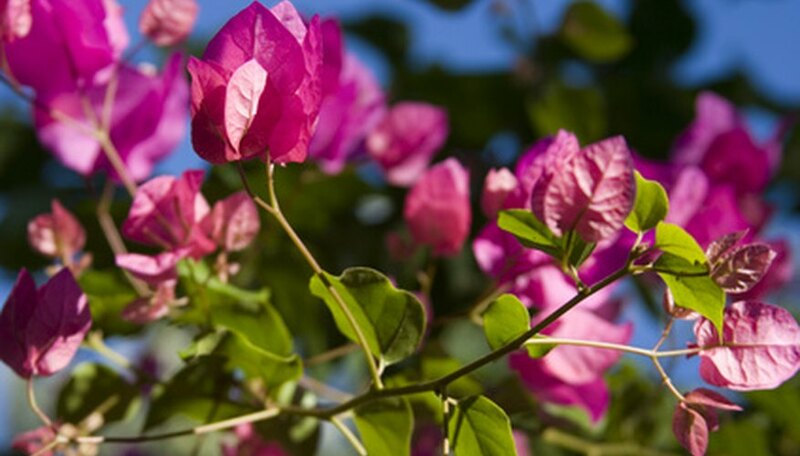 Bougainvilleas emit a sap that is toxic and very similar to poison ivy and poison oak. The sap can cause skin rash and itchiness. Because of this, when in close contact with bougainvilleas (for example, when pruning), individuals must be careful to avoid direct skin contact with the toxic sap. Bougainvilleas are commonly used as ornamental plants due to their attractive appearance. This is especially true in warm climates such as the Philippines, Australia, Aruba, Singapore, India, Thailand, parts of the United States (such as California, South Carolina, Hawaii, Louisiana, Texas, Florida and Arizona), Mexico, the Caribbean, the Mediterranean, Taiwan, South Africa, Ethiopia, Malaysia and Indonesia. In general, bougainvilleas are pest-free. However, they can be affected by some pests, including aphids, worms and various Lepidoptera larvae (like the giant leopard moth).